I was in front of a Planned Parenthood last Saturday with my I Regret My Abortion sign... a couple changed their mind! At age 19 my daughter Lisa faced an unplanned pregnancy. The father of the child and his parents pressured Lisa to have an abortion. This only fed her insecurity and fears about becoming a mother. Lisa scheduled the procedure at a nearby hospital. Our parish priest Fr Dominick was stationed at Assumption Church in Emerson, New Jersey at the time. The day of the abortion I explained the situation and Fr Dominick immediately rushed to the hospital to try and persuade Lisa to change her mind. Fr Dominick gave Lisa a rosary blessed by Pope John Paul. He spoke of what a gift this baby is to the family, and how loved this child and grandchild would be. Lisa walked away from the priest in tears and went into the procedure room to allow the doctors and nurses to assist in the destruction of her unborn baby. I cannot explain the level of grief and anger that flooded my heart and soul. I was filled with rage at the hospital and all involved with the procedure. But I was especially so deeply hurt and angry at my daughter for participating in the death of her child – my precious grandchild. Shortly after the abortion I went to talk to Fr. Dominick. He suggested I consider a Rachel’s Vineyard Weekend healing program to help me find a deeper healing of my loss as a grandparent. The Rachel’s Vineyard Retreat was a powerful experience of healing for me and really went to the heart of my post abortion trauma and grief and helped me to find peace and closure. I formed a number of close friendships from that experience and we remained in touch at support group meetings and social events loving and supporting, and praying for one another. During this period I would pray during Eucharistic Adoration and beg Jesus to call my daughter to healing. I could see how she was suffering terribly after the abortion. Six months after the abortion, my son asked Lisa to be the Godmother of his baby boy. 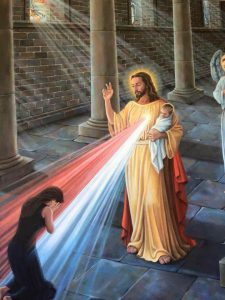 This event triggered a release of her pent up post-abortion grief and pain and Lisa suffered a nervous breakdown requiring hospitalization. She recovered from the breakdown, but remained deeply wounded. Two years after the abortion she met a man with an abortion in his history. He encouraged her to consider the Rachel’s Vineyard weekend. When Lisa told me she was considering making a retreat, I was overjoyed. I was blessed to be able to attend the memorial service on Sunday of her Rachel’s Vineyard Retreat. The participants honor the child with a special memorial service and Mass and entrust the children to the Lord. When I opened the memorial service program I looked over the list of names of the babies being entrusted. I knew right away the name Lisa had given my grandchild…Dominic Leonard. Lisa named the baby after the priest, Fr. Dominick who had been so kind to her and who tried to stop the abortion, and after the abortion continued to reflect the love and mercy of Christ to my daughter. She gave the baby the middle name of Leonard after my dad, who Lisa loves dearly. We know now that Dominic is alive with the Lord. We grieved and honored the child together as mother and daughter – as mother/grandmother. This was a time of grace and healing in our relationship which had been so deeply damaged by abortion.